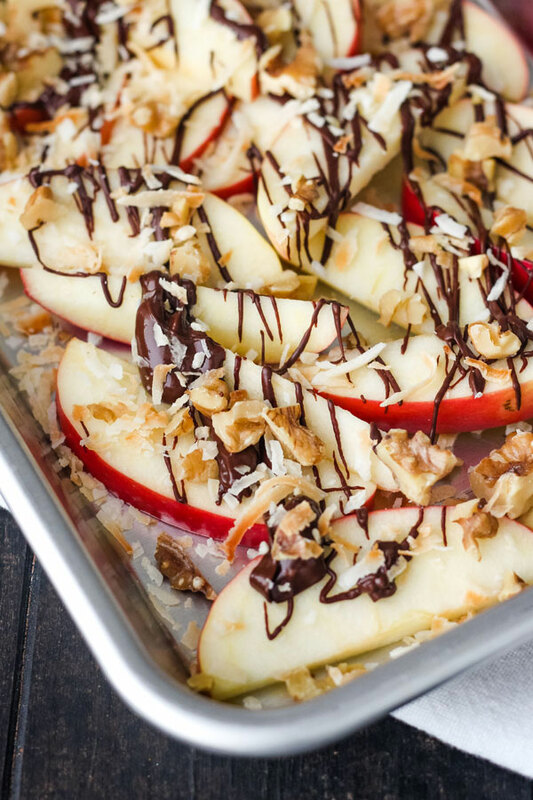 Apple Nachos For Two – crisp apple slices topped with melted chocolate, toasted nuts, shredded coconut, and anything else your taste buds desire. Perfect as a late night dessert or fun after school treat. 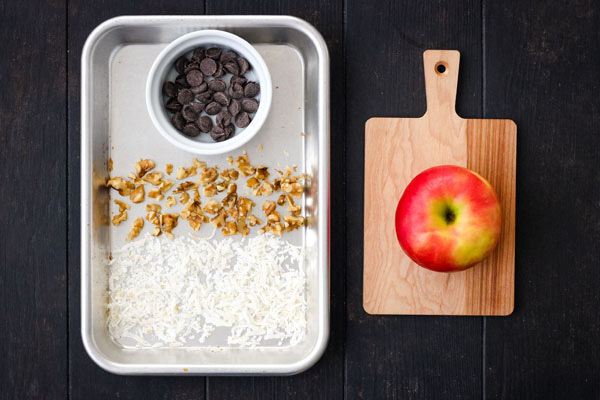 Introducing our new favorite dessert: Apple Nachos For Two. Like this toaster oven baked pears recipes, they’re easy to throw together, loaded with great flavors and textures and the toppings are totally customizable. We like the combination of chocolate + flaky coconut + chopped nuts. 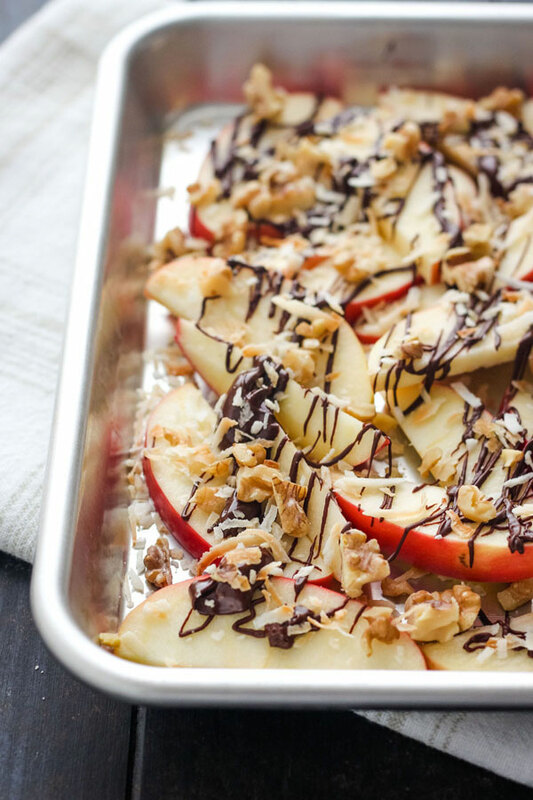 It makes a plate of simple apple slices taste like something from a gourmet chocolate shop. 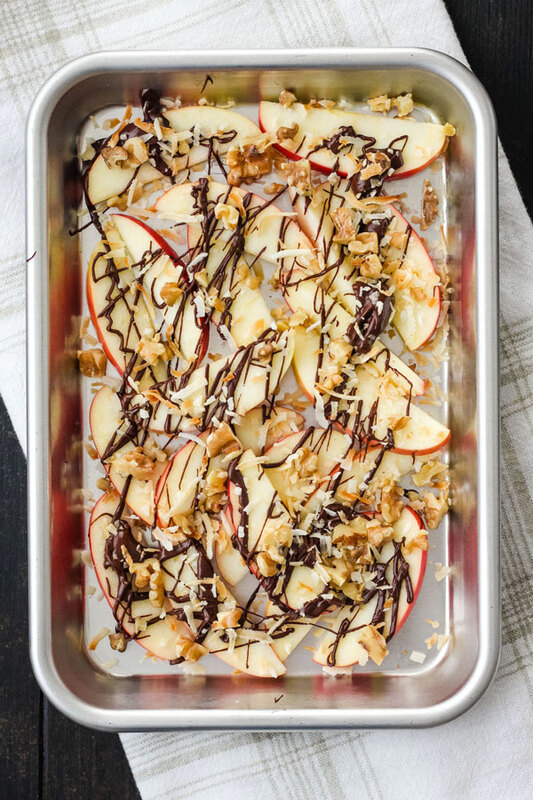 Apple nachos aren’t a new idea but what makes this recipe special is that all of the heating, melting, and toasting happens in your toaster oven! 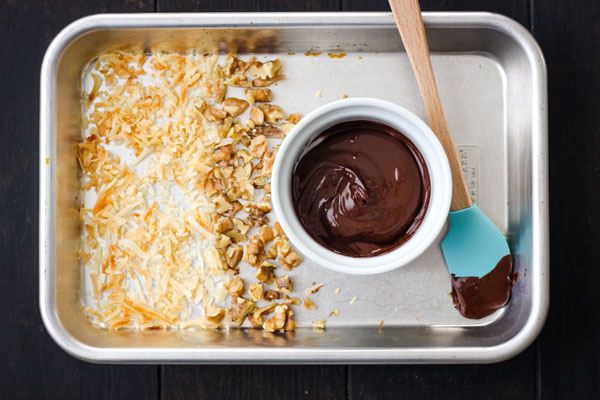 The trick is using a low heat to toast the coconut and nuts while the chocolate gently melts. An Apple. Pretty much any CRISP apple variety like Granny Smith, Jazz, Honeycrisp, or Pink Lady will taste fantastic. BTW if you’ve got an extra apple hanging around I recommend treating yourself to this gooey Grilled Cheese with Apple and Havarti. Something to Drizzle. I like melted semi-sweet chocolate chips, their flavor is decadent and rich without being overly sweet. If you’re looking for a no-sugar-added dessert, swap the chocolate with 2 tablespoons of natural peanut butter – it’s delish! Nuts. Use any kind you want. Walnuts, cashews, peanuts – they’re ALL yummy. Just make sure to chop whole nuts into pieces before toasting. Unsweetened Shredded Coconut. Toasting it takes half the time of the sweetened stuff and it tastes great too. 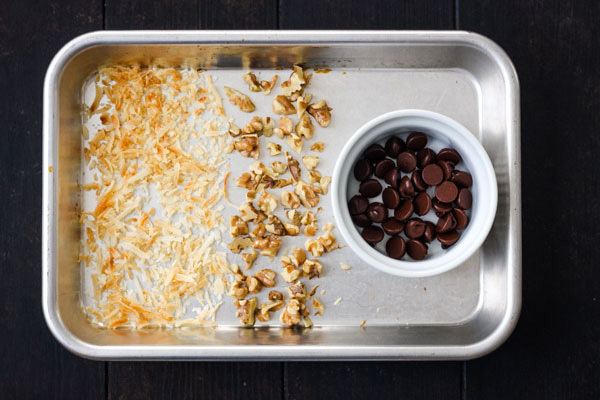 Begin by adding a small baking sheet filled with your coconut, nuts, and ramekin of chocolate chips to a preheated 300 degrees F toaster oven. Cook until the nuts and coconut are toasted and the chocolate is shiny about 4 to 5 minutes. If the chips don’t look melted – no worries. Give them a stir and the chocolate will magically turn smooth and ready to be drizzled. Now, cut your apple into slices and toss on a plate. If you’re feeling fancy, you can arrange the slices into a pretty spiral. The melted chocolate comes next but don’t rush yourself. Drizzling it on is almost as fun as eating the nachos. Lastly, top the slices with the toasted coconut and nuts. Grab a big stack of napkins and dive on in!